Happy Thanksgiving to those of you who celebrate it. Happy Thursday to everyone else. After my success in creating last year's Raspberry Chipotle Sweet Potatoes, I thought it might be a fun challenge to come up with a completely new and different sweet potato dish this year. Given how much I've been enjoying the roasted butternut squash soup this season, roasted sweet potato soup seemed like the logical choice. 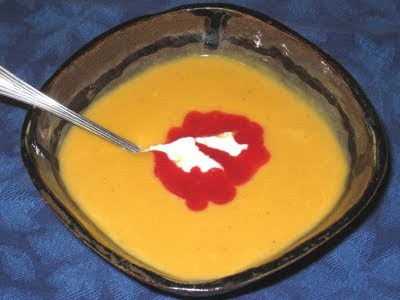 I was going to keep the same ingredients as last year and make a raspberry chipotle sweet potato soup, but seeing as how it's Thanksgiving, I thought it might be interesting to use cranberries instead of raspberries. It turned out to be a good match. The natural tartness of the cranberries added a fresh zing to the velvety smooth sweet potato. The chipotle added just the right amount of smoky spice. I was careful not to add too much so it would not be too spicy. I think I succeeded. The heat builds slowly and leaves a warm tingle by the time the spoon has scooped up the last little drop. This recipe uses the same basic techniques as the Roasted Butternut Squash and Shallot Soup I adapted from a Cooking Light recipe. The more I cook, the more I realize how many dishes are built from the same foundations. In this case, you take some vegetables, roast them up, add some liquid and puree them, and you have an almost infinite array of possibilities. But for Thanksgiving, sweet potatoes and cranberries are definitely the way to go. Preheat the oven to 375 deg. F.
Place the cubed sweet potatoes, halved shallots and garlic cloves in a roasting pan and toss with the olive oil. Add the thyme; season to taste with salt and pepper and toss again. Roast in the 375-degree oven for about 45 minutes, or until tender. Let cool for 10 to 15 minutes. While the vegetables are roasting, place the cranberries in a small saucepan with the water and sugar. Bring to a boil over medium-high heat and let boil until the berries burst, about 5 minutes. Watch this constantly; it can boil over pretty quickly. Let the cranberry mixture cool completely. Use a stick blender to make a puree, adding water if necessary to give it the consistency of a thick syrup. Put the roasted vegetables into a large soup pot and add the vegetable broth and the chipotle pepper. Add salt and pepper to taste. Bring to a simmer over medium low heat. As soon as it has started to simmer, remove from the heat and, using a stick blender, blend until smooth. Return the pan to the stove and bring back to a simmer. Add the milk and 1/2 a cup of the cranberry puree, and stir well. Add more water or milk as necessary to reach desired consistency. Taste and adjust seasoning. Add sherry and mix well. Remove from heat. Serve immediately, garnished with a tablespoon of cream topped with a tablespoon of the cranberry syrup. this sounds yummy. i am hungry already. I love chipotle in anything. I've saved this to make next week!